I've recently had a notion to put together a Rohirrim kit based on my love for the Anglo-Saxon period of English History of which the Professor also took great inspiration for the whole of Middle-Earth. I've recently been reenacting 13th century English civilian and soldier during the Magna Carta years, and after sending a pic to Greg he commented on the fact that it could be Rohirric with some modification. I've also recently acquired for myself a horse. Here are some pics of my kit and a helmet I would like to acquire for it. I'm open to some suggestions! Full marks on acquiring a horse, there, lad! Good on you. 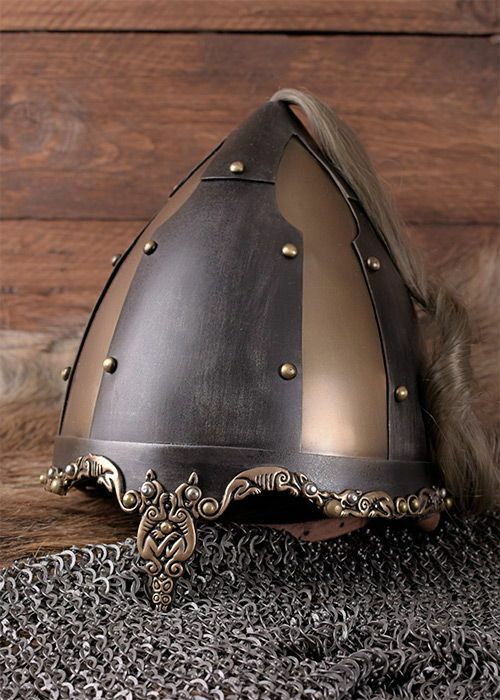 The coif, or biggins, worn as a regular hat rather than something under a helmet, is something from a later period than Anglo-Saxon/Viking era, from what I recall. I know this is a fantasy world, but the Rohan are based on early Anglo-Saxons. The helmet looks all right for a spangenhelm. It would fit right in there. 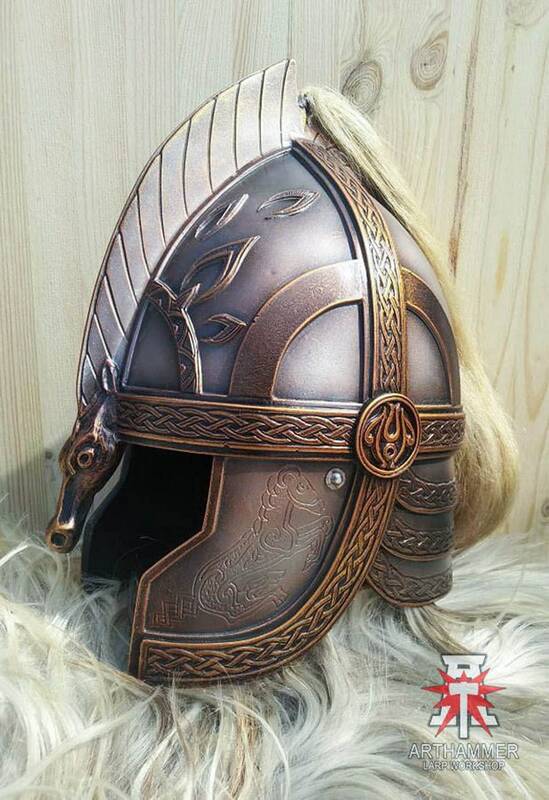 But look to see if you can pick up something more like the Coppergate or Sutton Hoo helmets. Actually, it is a pretty good price after all. It's cool what a short jump Rohan kit is from where you are. I think Kortoso's right that the head covering looks a bit off for Rohan, but I've no idea what they might have used instead. Perhaps taller boots for riding? That seemed a thing historically, and I assume for a reason - not that I know it. I love love love the tunic and trousers! Maybe some horse-related embroidery along the sleeves and neck? ... that might more solidly ground the impression in Rohan. I think you already look like you could ride across the Westfold and not look out of place: it's only the little cultural cues that would pull what you have from more generic medieval to Rohirrim. And even then, a lot of those cues might be more upper-class than you want to go. At the freeman level, I imagine there's not much difference. And what a lovely horse! Do you practice with the lance? I'm curious what that's like. A new impression is always welcome! Simplicity is great to see and as Elleth said, very easy to push from generic early medieval into authentic Rohirric. One problem is that we have practically ZERO references to what people wear in Rohan (actually I think Eowyn wearing white might be the only description! )...the best we have is his comment in Letter 211 that "The Rohirrim were not ‘mediaeval’, in our sense. The styles of the Bayeux Tapestry (made in England) fit them well enough". I'd second the comment to try and dress it up with as much equine decoration as you can, because even for something simple as a herdsman, that's what will really ground your impression in this particular culture. Thanks for the advice! I’m planning to base it heavily on the anglo Saxons and the illustrations of Alan Lee as I think he remained faithful to history and Tolkien despite what ended up on the screen. Trying to figure out how to include some horse motifs in my kit. Holy captain crap it's Jake! Good to see you! I like where you're going with this. I'll be watching! I pulled these images and I quite imagine that this is how the everyday Eorlingas would look. Very inspired by the group "Thegns of Mercia". I could really kill two birds with one stone, a legit Anglo Saxon impression as well as a Rohan impression. So first of all jbook your horse is beautiful! What is his or her name? Very good job researching and taking cues both from Anglo Saxon history/images as well as the amazing illustration done of the Rohirrim by that god among men Alan Lee. You are spot on with those images of Eorlingas daily wear! I love the direction you are going with your kit development, keep it up! Now for the contentious bit! Contrary to what other forum members have said, I actually really like your choice of helmet for your persona. I think that culturally it completely falls in line with a lower ranking Eorlingas. I would disagree with getting a Coppergate or Sutton Hoo style helmet. These are indeed similar to the helmets we see in the films, but we really only see those types of helmets on the elite horsemen of the king and the officers. Otherwise I think your kit is great! I would say that the two crucial pieces of kit you will want will be high boots for riding and then a shield that you could put some form of Rohan heraldry on.